Bimmy and Jimmy, er... Billy and Jimmy are back! Arc System Works is revisiting the series with Double Dragon IV. Now, this title may be a big confusing since there was already a crappy 1:1 fighter called Double Dragon V on the SNES, Genesis, and Jaguar (we own it; it's terrible), but this is an all-new game in the series that takes place after the events of Double Dragon II, using the series' original sprite art. A number of team members form the original arcade release have joined the team as well. 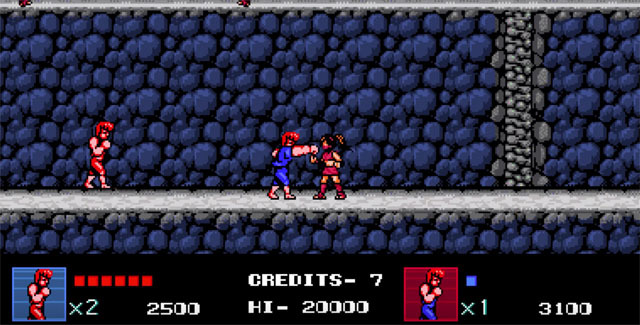 Players can go it alone or team up with a friend to bash in some faces, spin kick gang members, and pummel the occasional Abobo. The game is set for release on PS4 via PSN and PC via Steam on January 30, 2017. 2017 also marks the 30 year anniversary for the series.